The Lake Whitefish or Coregonus clupeaformis is one of the most popular fish to eat in North America. They are found in most parts of Canada and also throughout the great lakes and Minnesota. This freshwater fish is normally found in deep cool waters as most fisherman will tell you. The only exception is when the Lake Whitefish is spawning in the late fall and early winter. At this time they can be found in waters as little as 2 meters in depth. This species of Whitefish has two dorsal fins including one adipose fin, a blunt nose, fins almost look clear. They also have a greenish brown back with silver sides. 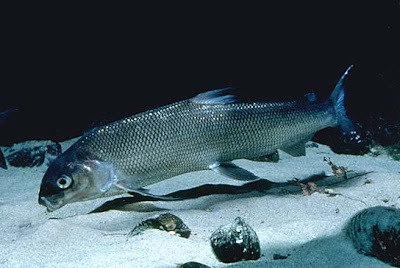 The Lake Whitefish has a small mouth so it is limited to dining on insects, freshwater shrimp, small fish and fish eggs, and bottom organisms. These fish can reach up to 20lbs and are often found in schools. If you have any other information about the Lake Whitefish, including recipes and fishing tips please let us know by leaving a comment.